The next generation of smartphones and tablets may depend on artificial sapphire glass as a key selling feature. With artificial sapphire, scratched phone screens could be a thing of the past – owing to sapphire glass’s superior scratch resistance. High Purity Alumina is a key ingredient in artificial sapphire glass. 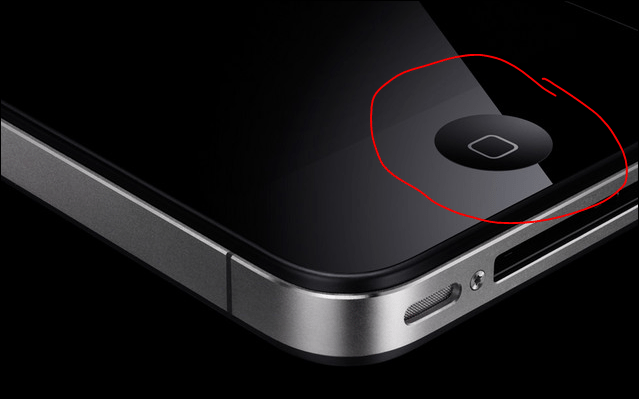 Apple currently uses it sparingly for the iPhone – check out the home button on your iPhone – that’s made with artificial sapphire. 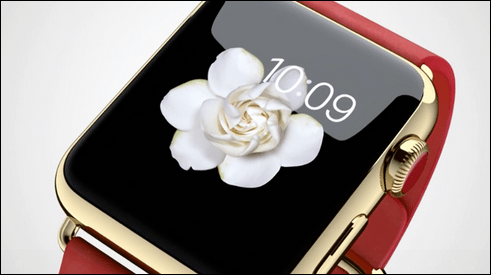 Apple’s soon to be released smart watch will have a sapphire glass display . 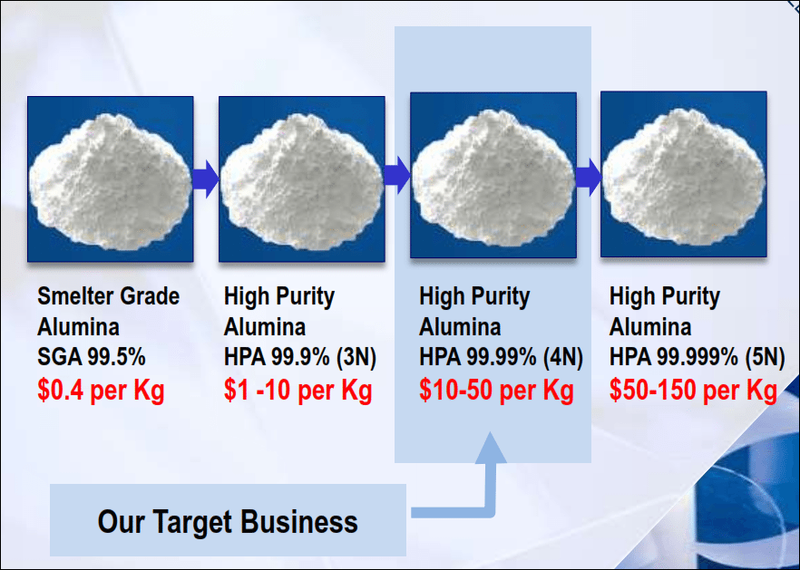 There are no companies on the ASX who are dealing in High Purity Alumina – except for one. 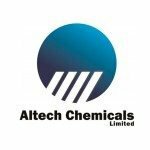 It’s a company we have invested in, the sub $10M market cap junior Altech Chemicals (ASX:ATC). ATC have a stockpile of aluminous clay feedstock, and plan to bring a 4,000 t/pa High Purity Alumina plant into production in the coming years in Asia, where 70% of the demand for this material resides. It’s not just smartphones though, strong existing markets for this product are high performance electronic applications like LEDs, semi-conductors, and phosphor display screens. 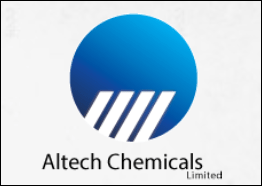 Altech Chemicals (ASX:ATC)’s vision is to become a leading global producer of High Purity Alumina (HPA). ATC has 100% owned aluminous clay feedstock resources in Western Australia ready to go and plans to develop a full scale 4,000 tpa High Purity Alumina production plant. It’s painstakingly developed advanced processing technology and produced test batches of 99.99% High Purity Alumina already – this is in the upper boundaries of purity for this valuable substance, and can sell for approximately $50/kg. 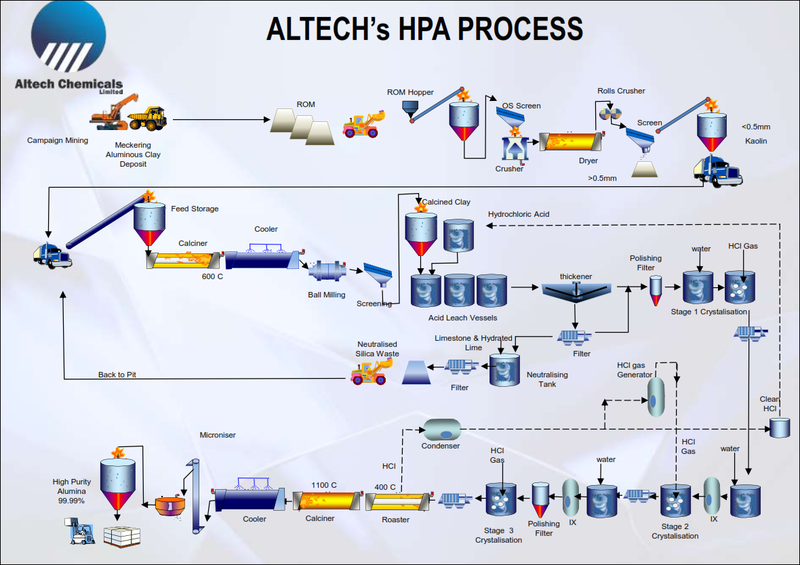 This process uses off the shelf plant and equipment, meaning costs are minimised. ATC has just selected a site in Malaysia to build a 4,000tpa processing plant – in one masterstroke move ATC can slash costs by up to 40% compared to high cost Australia, and sling itself into the bottom quartile of operating costs for the world’s High Purity Alumina producers. Conveniently, the Malaysian will be next door to Tanjung Landsat port, will be on the door steps to ATC’s likely Asian electronic producing customers – 70% of High Purity Alumina demand is in the Asia Pacific region. 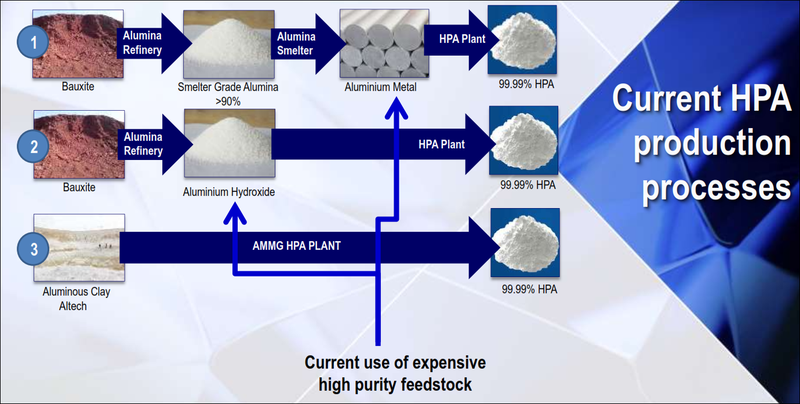 Based on an Integrated Plant Study for ATC’s proposed operation, the unique in house processing method, and the recent decision to construct the processing plant in Malaysia, the company could be producing High Purity Alumina for just $8.60/kg in global markets. ATC is itching to progress to construction on their plant, however need some additional support. The company has $1.3M in the bank and up to $600,000 in R&D rebates coming its way – but it’s currently raising $2.69M to make sure a Bankable Feasibility Study (BFS) for its Malaysian processing plant gets done and its momentum can be sustained. But ATC is keeping the raise in house. 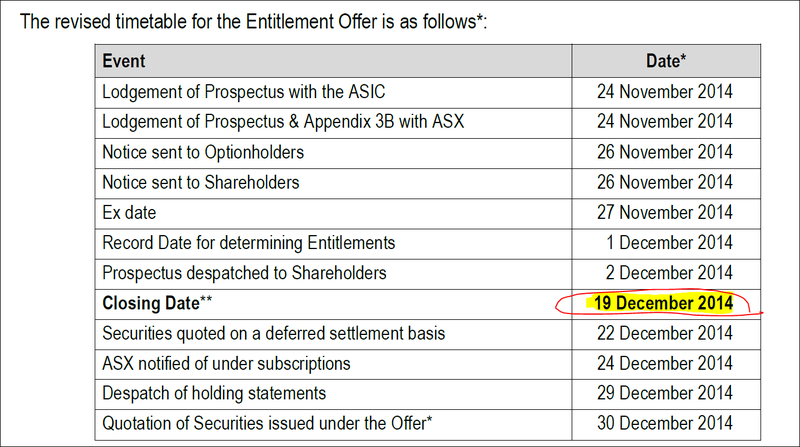 The Entitlement Offer allows ATC shareholders the opportunity to take up one new share at $0.10 for every four shares held at the Record Date – the 1 st of December 2014. A free attaching listed option also comes with the offer. ATC was formerly called Australian Mining and Minerals Group – but the company recently changed its name given its tighter focus on High Purity Alumina production – described in detail in this article: ASX Company to Supply World’s Smart Phone Makers. 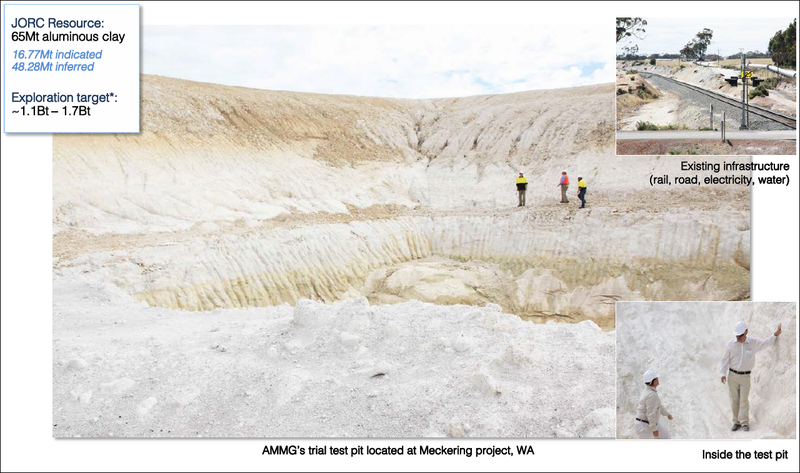 ATC have a 65 Mt aluminous clay JORC resource in Meckering, Western Australia – essentially a large pile of clay that can be used to make High Purity Alumina. The 100% owned 65Mt JORC resource should do as a feedstock for the foreseeable future, but if that starts running out, ATC also own over 1 billion Mt worth of exploration targets spread throughout Western Australia. Clay feedstock is very different to the usual bauxite sources that are used worldwide to make High Purity Alumina – it’s much purer and needs far less refining to make the product. However due to its superior scratch resistant qualities, smart phone makers like Apple and Kyocera are embracing this new material and the market for High Purity Alumina is expected to grow from 19,000 to 48,000tpa in the next four years. ATC has spent the past couple of years refining its processing technology and developing its aluminous clay feedstock sites in Western Australia. Breakaway Research has issued a comprehensive research note on ATC that you can access here . At first glance, this seems impressive, but we always apply caution to analyst price targets – they don’t always eventuate. A section of Mr Craighead’s report is dedicated to ATC’s project financials, and he describes two methods of arriving at a fair valuation of ATC. It should be noted that as ATC is only at the early stages of project development, it’s difficult to arrive at any hard numbers. Over the coming months as ATC goes about its Bankable Feasibility Study, some number should start to firm up. The first way Mr Craighead values ATC is by considering a forecast EV/EBIDTA of the company – on a 7.5 x EV / EBITDA multiple, typical for chemical processing companies, selling High Purity Alumina at $20/kg, with operating costs at $8/kg, Mr Craighead arrives at a $360M potential valuation, once the plant is fully up and running. It should be noted that in both of the above cases, just 7.5% of the full project value was considered – owing to the early stage nature of the project. These are also only estimates of the potential of ATC – there is no guarantee that ATC will get there. A four for one offer to light ATC’s fuse? ATC has launched a pro rata non-renounceable entitlement offer to raise up to $2.69M – the board and a major shareholder have already committed over $200,000. ATC is raising this money so it can accelerate its plans to bring its planned 4,000tpa 99.99% High Purity Alumina plant into production as quickly as possible and ultimately become a leading global producer. ATC appears to be in the right place at the right time – poised to take advantage of the growing High Purity Alumina market catering to the next generation of LEDs and smartphones using Sapphire Glass. But to do that it needs that processing plant up and running – and that requires a capital outlay. The company’s current cash position remains strong with $1.3M in the bank, plus it’s anticipating a rebate of $0.5-$0.6M for its extensive Research and Development related activities during the 2014-2015 year, which should come in by Q3 2015. 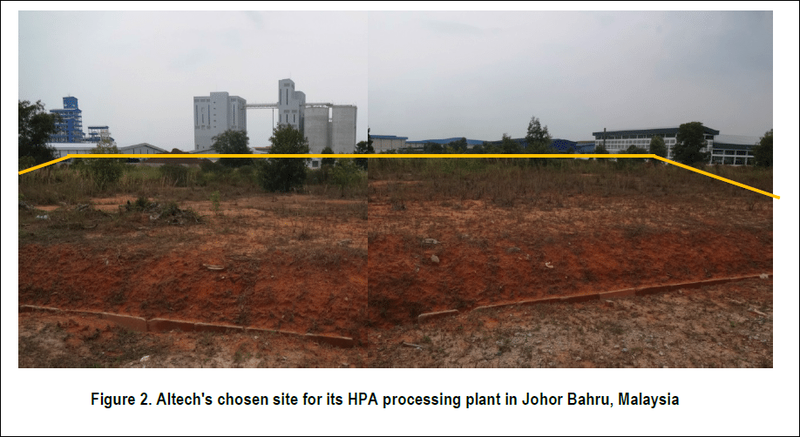 However, ATC wants to raise additional short-term funds in house to make sure a Bankable Feasibility Study (BFS) for the construction of a High Purity Alumina processing plant in Johor Bahru, Malaysia is completed – more on that soon. This a first-time opportunity for ATC shareholders to increase their holdings by subscribing to new securities since the company listed on the ASX way back in 2010. The Entitlement Offer is on the basis of one new share for every 4 shares held on the Record Date of December 1 st , with one free attaching listed option for every new share issued. Each option will have an exercise price of $0.10 and an expiry date of 15 th December 2015. ATC are expecting to raise approximately $2.69M – before costs. At The Next Tech Stock we think this is a pretty decent offer given the plans ATC has. 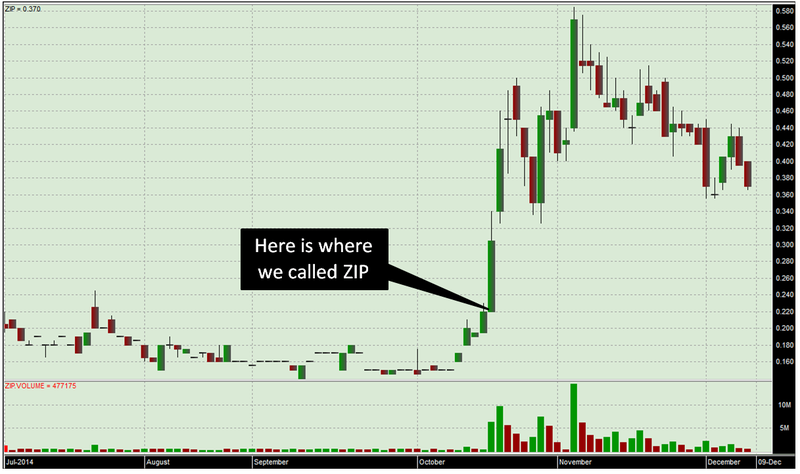 It’s in house so it rewards shareholders and allows ATC to retain proportional holdings – there will be no dilution. Plus, shareholders are able to apply for shares and the free Attaching Option in excess of their Entitlement by nominating the amount of additional shares (and free Attaching Options) that they would like to apply for on the Entitlement application form. Option holders that are not Shareholders and wish to participate in the Entitlement Offer can make an application as part of the Shortfall Offer, which will remain open for up to three months following the Closing Date of the Entitlement Offer on the 19 th of December. ATC plans to be producing high quality High Purity Alumina using its own feedstock, extraction technology and refining process – costs are being kept to an absolute minimum, as ATC controls every step of this process. ATC has been searching for the perfect site for its High Purity Alumina plant and looked all over South East Asia and Australia, including Kwinana in WA – not too far from its Meckering feedstock. However, the most attractive option, based on costs was Malaysia, at the Tanjung Langsat Industrial Park in Johor Baru, the capital city of Johor state. In one single move, estimated operating costs are slashed 40% lower than if the plant was built in Australia, and in the region of 50-60% lower for the capital costs of plant construction. A big attraction is obviously the price tag – locating ATC’s proposed High Purity Alumina processing plant in Malaysia should slot it into the bottom quartile of operating costs for the world’s High Purity Alumina producers. The Tanjung Langsat Industrial Complex caters to light, medium and heavy industries, so everything ATC needs for its refining process is easily obtainable – hydrochloric and sulphuric acids, power and natural gas are all available at competitive prices. Also, the plant will be strategically located within Asian markets hungry for the high quality High Purity Alumina that ATC will be soon be producing. Johor has three sea ports and an international airport at Singapore – there’s also a sea container port right next door to the Tanjung Langsat Industrial Park so getting the feedstock shipped from Fremantle in WA, processed at the plant in Malaysia and then exported to the world should be as smooth as the Sapphire Glass High Purity Alumina is used to make. 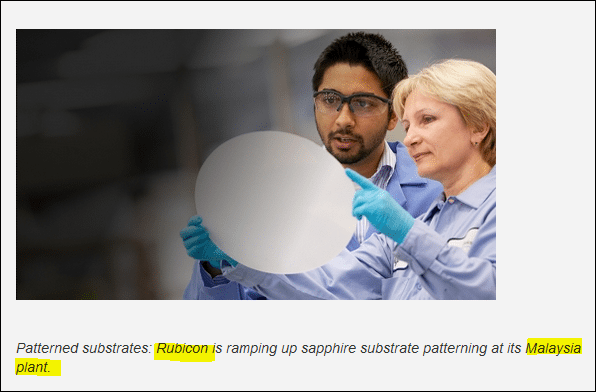 And ATC may not have to look far for customers – Sapphire Glass producer Rubicon Technology (NASDAQ:RBCN) operates a facility in Malaysia – could they become a local customer? Malaysia’s work force is highly skilled and Johor has an intense concentration of manufacturers of electronics, semiconductors and artificial sapphires – just the neighbours ATC could sell to as it brings its 99.99% pure High Purity Alumina into mass production. 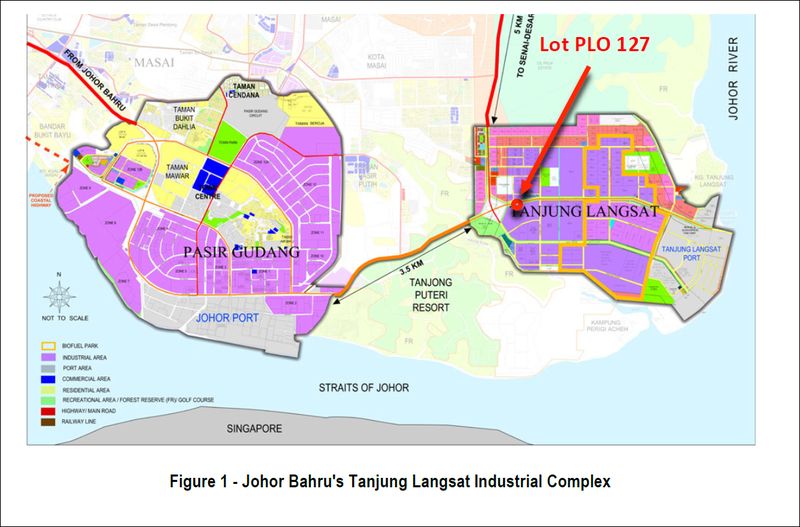 Moving forward, a Letter of Intent has been sent to the Tanjung Langsat Industrial Park to reserve the land, and ATC has appointed Dayo Echo Techno Sdn Bhd to assist with the necessary approvals for the construction and operation of its plant. 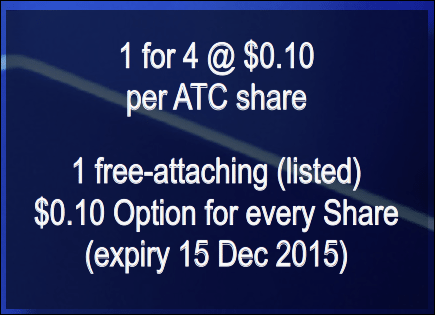 ATC’s share and options offer ends on December 19 th . ATC hopes to raise $2.69M with this offer and use the cash to bolster its efforts to nail a Bankable Feasibility Study for its proposed 4,000tpa High Purity Alumina processing plant in Malaysia. All of this is setting up a big 2015 for ATC as it moves into Bankable Feasibility Study mode. In 2014 ATC set a clear course to become the world’s next leading High Purity Alumina producer – and in a few weeks we expect ATC will be seriously cashed up and on track to execute its plans.